Private communication, 7 November 1977. Prof. Abraham also remarked that the Russian Music Society had run a similar competition the previous year, but this was probably only open to Russian composers. See also Leo Kaaben, Instrumental’nyi ansambl’ v russkoj muzike [The Instrumental Ensemble in Russian Music] (Muzgiz, Moscow, 1961), 169. The same information was published in the Musikalisches Wochenblatt, 15 June 1877, 8. Hermann Grädener (1844–1929) was an organist, conductor, teacher (at the Vienna Conservatoire and the University) and a composer: his contacts with Mahler seem to have been few, and indeed during his tenure as conductor of the Vienna Philharmonic concerts Mahler turned down a symphony by him for performance (HLGIV, 54). 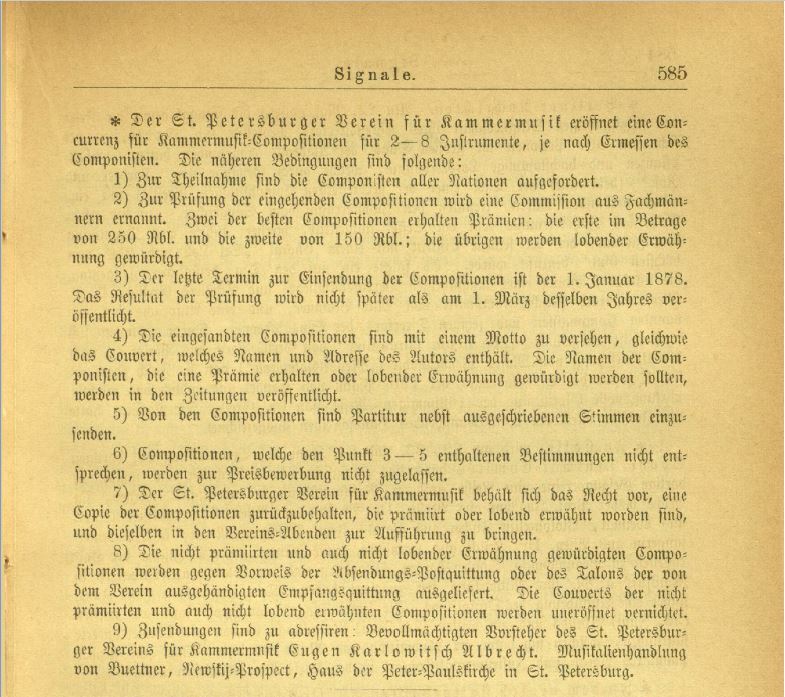 So far no report on the outcome of the competition has been located in either of the journals cited above, but from an advert (Musikalisches Wochenblatt, IX/36 (30 August 1878, 437) and a report of the 1877/8 concert season of the Society (ibid., IX/48 (22 November 1878), 582) it is clear that Scholz did win a prize for his String Quintet in E minor, op. 47, that it was performed in St Petersburg, and was published by Julius Hainauer in Breslau. The rules of the competition may offer an explanation as to why Mahler's Piano Quartet was not returned: if they wanted their manuscripts back, the composers of works that did not received a prize or honourable mention had to pay the return postage (§8). However there is a postscript to the competition: in 1879 Breitkof & Härtel announced that they had some of the competition entries and would be willing to send them to their rightful owners, raising the possibility that Mahler's score and parts had at least found their way back as far as Leipzig. The problem with this narrative is that it does not fit comfortably with Mahler's recollections: even allowing for his mistake over the length of his conservatoire studies (three, not four, years) Mahler seems to be suggesting that the competition dated from c.1878–1880 or possibly later. Although Signale and the Musikalisches Wochenblatt both reported regularly on the St. Petersburg Society for Chamber Music, they seem not to contain any reference to another composition competition organised by the society within this period: the next was the 1880/1881 competition for an essay on the subject of 'Die geschichtliche Entwicklung der Kammermusik und ihre Bedeutung für Musiker' ('The historical development of chamber music and its significance for musicians') (Musikalische Wochenblatt, XII/6 (3 February 1881), 76). Another outstanding issue is whether this Piano Quartet was in anyway related to one or both of the surviving fragments by Mahler for this combination, the Piano Quartet Movement in A minor, and the Scherzo in G minor: at present there seems to be no strong evidence that might contribute to a resolution of that question.